Thinking of getting braces but don’t want the embarrassment that comes along with them? Traditional braces are bulky, uncomfortable, and can take years to get off. It’s no wonder why only 35% of adults have well-aligned teeth. There’s a treatment option that might be right for you. It’s called acceledent. This treatment uses vibration in order to increase comfort and speed in straightening teeth with braces or aligners. It takes no time at all to do and can fit a hectic lifestyle. To find out if it’s a fit for you, let’s go over some facts. 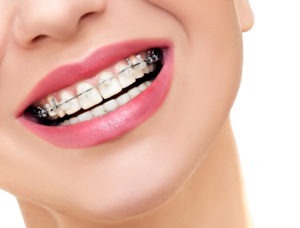 With traditional braces, they are visible throughout the course of treatment and there are frequent appointments to get wires adjusted requiring trips to the orthodontist often. Invisalign clear aligners provide a more aesthetic treatment option and people wear them to work, school and play without distraction. But even this can be sped up. Enter acceledent. This treatment offers people with braces to get a beautiful smile in as little as half the time normal treatment would take. It is used in cooperation with braces or Invisalign. It can be used at home! You’ll be in the comfort of your living room while you complete your treatment. All it takes is 20 minutes with this FDA-cleared medical device. It works to vibrate the teeth which increases blood flow and permits the aligners or braces to move your teeth rapidly without discomfort. If you have 20 minutes then you can straighten your teeth up to 50% faster. We all know braces can hurt. Sure, there are other ways to soothe the pain such as creams but they don’t work that well. If you’re tired of putting up with the soreness that comes with braces, acceledent is right for you. Along with its ability to spped the straightening of teeth, it also reduces pain. The vibrations stimulate blood flow which allows teeth to move quicker. Did your orthodontist say you’ll get your braces off in two years? Maybe more? If that doesn’t seem like a long time to you, just think of all the events that’ll happen within a year. Weddings, meetings, dates, and family events. All of that can make a person feel shy about the way their smile looks. Braces and aligners are hard enough to wear but even harder to feel confident in. You’re working your way to a beautiful smile but what if that time could be cut in half? Instead of two years, it’ll only take one. Think of all the years ahead when you won’t be wearing braces. You’ll be able to attend events without having anxiety about your braces. It makes the world of difference when we feel confident. Now there’s a treatment option that will meet the demands of your life and create your most beautiful smile in half the time. "I can’t argue the best! It is simply the BEST. Amazing service from everyone on the staff! Fabulous results for both my kids and myself. A+"K C.
"The staff here is fantastic. They’re friendly, professional, and incredibly quick to answer all needs. "John K.
"The staff is incredible, the service is simply the best and it all starts at the top with Dr. Alborzi"Jon W.
"Dr. Alexa Alborzi and the entire staff have changed my life in a very powerful way. "Mary C.
"Dr. Alborzi is very friendly, and everyone on staff is always kind and seems happy to be at work. "Kylie A. "The most friendly and well organized dental group our family has ever encountered! Dr. Alborzi is always smiling ~ great work! "Susan O. "The most friendly and well organized dental group our family has ever encountered! Dr. Alborzi is always smiling ~ great work!" "Dr. Alborzi is very friendly, and everyone on staff is always kind and seems happy to be at work." "Dr. Alexa Alborzi and the entire staff have changed my life in a very powerful way." "The staff is incredible (love ya, Julia), the service is simply the best and it all starts at the top with Dr. Alborzi"
"The staff here is fantastic. They’re friendly, professional, and incredibly quick to answer all needs." "I can’t argue the best! It is simply the BEST. Amazing service from everyone on the staff! Fabulous results for both my kids and myself. A+"
Dr. Alexa Alborzi, our San Mateo, CA orthodontist and our Half Moon Bay, CA orthodontist offers the most advanced braces for children, braces for teens and braces for adults, including metal braces, Damon braces, clear braces and Invisalign. Come experience Alborzi Orthodontics and you will see we offer effective orthodontics with a smile to patients in and around San Mateo, CA, Half Moon Bay, CA, Burlingame, CA, Foster City, CA, Hillsborough, CA, Millbrae, CA, Belmont, CA, Montara, CA, Moss Beach, CA, and El Granada, California (CA). Call 650-305-7161 today for your free consultation for braces at either our San Mateo orthodontics office or our Half Moon Bay orthodontics office. What is the best day and time for you to schedule an appointment? The best phone number to reach you at? Need more information before you decide? Book your appointment before the July 30th and receive a $500 discount on any full treatment plan, when accepted.